The riding center LA CORBERA, is situated South of Seville, near the town of Utrera, about 20-30mins drive from Seville. Utrera is very well known for producing very good flamenco singers and bullfighters, as well as homing some of the most famous bull breeding farms. We either pick up clients in their hotels or otherwise they drive out. 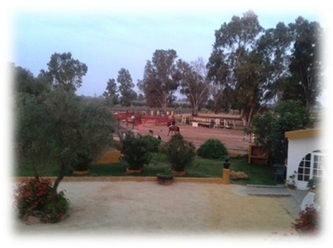 The Riding Centre La Corbera is a beautiful and traditional Andalusian farm house and state, known here as “Cortijo”. 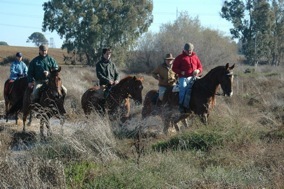 Riders arrive at the center and, since we’ve previously been in touch, horses are ready depending on the level of riding (beginners, intermediate or advance). 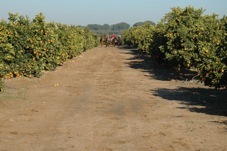 We have 40 horses, mainly Hispano-Arab and Anglo-Hispano-Arabs, very well trained. 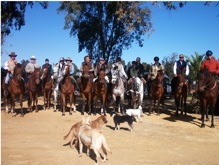 Normally Alfonso, owner of the state and a great horseman with an extensive background in Doma Vaquera and at present competing in TREC, greats his guests. He is passionate about his horses so his briefing on them before the ride is most interesting. Riders try their horses for 15-20mins in our arena before going out, to make sure they get on along with their ride and are comfortable with the saddle. 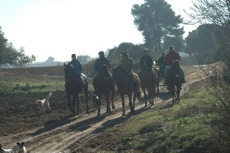 Alfonso has a great relationship with all his neighbour’s so once we leave Alfonso’s state (Finca) we will be riding through other peoples farms and on some wild countryside belonging to the local county councils. 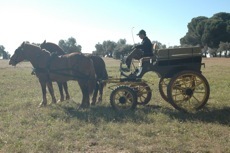 Alfonso’s dogs always ride out with us and we’re also able to offer a driven carriage “paseo” if the client does not ride. 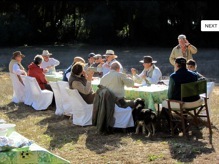 Once we get back to the “Cortijo” everybody has a farewell drink. Most of our clients of a day leave so pleased with the experience that sometimes they book with us a week-end experience. 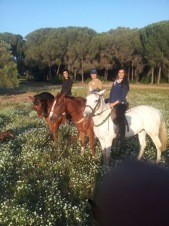 Once everybody is settled with the horse assigned we start our ride. 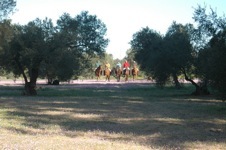 Through out Andalucia you’re still able to ride in incomparable landscapes hardly touch by human hand: we will be going across fields of oranges and olive groves, along ancient bridle paths and through forests of pine and eucalyptus.